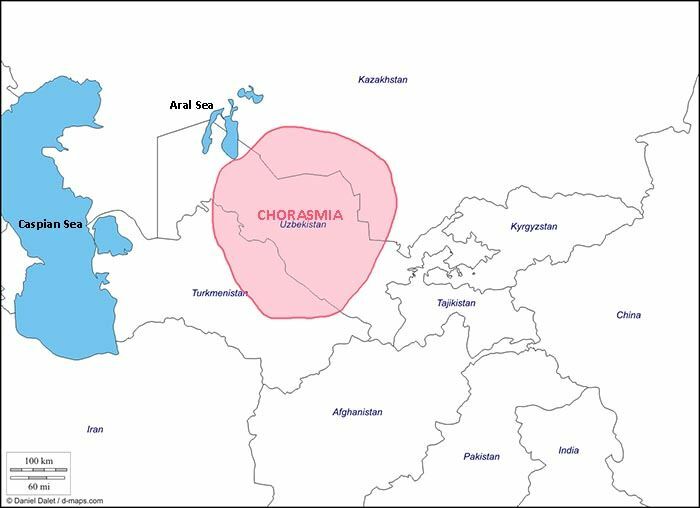 Chorasmia - or Khwarazm - is a large oasis region on the Amu Darya river delta in western Central Asia, bordered on the north by the (former) Aral Sea, on the east by the Kyzylkum desert, on the south by the Karakum desert, and on the west by the Ustyurt Plateau. It was the center of the Iranian Khwarazmian civilization, and a series of kingdoms such as the Persian Empire, whose capitals were (among others) Kath, Gurganj and – from the 16th century on – Khiva. Khwarezm and her cities appear in Persian literature in abundance, in both prose and poetry. Dehkhoda for example defines the name Bukhara itself as "full of knowledge", referring to the fact that in antiquity, Bukhara was a scientific and scholarship powerhouse.